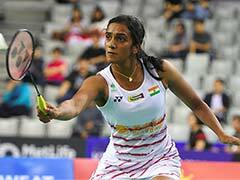 PV Sindhu advanced to the women's singles quarterfinals of Singapore Open with a straight games win over Mia Blichfeldt of Denmark on Thursday. Sindhu took just 39 minutes to record a 21-13, 21-19 win over the world number 22. The Olympic silver medallist will next face China's Cai Yanyan in the quarterfinal. Saina Nehwal defeated Thailand's Pornpawee Chochuwong 21-16, 18-21, 21-19 in the second round to reach quarterfinals. Last week, Chochuwong had defeated Saina 20-22, 21-15, 21-10 in the first round of Malaysia Open. On the other hand, Parupalli Kashyap, who defeated Japan's Yu Igarashi 15-21, 21-16, 22-20 in the final round of the qualification to seal his place in the main draw, was knocked out after losing 9-21, 21-15, 16-21 to China's Chen Long in the second round. The reigning Olympic champion defeated Kashyap in 71 minutes. In the other match, Kidambi Srikanth defeated Hans-Kristian Vittinghus of Denmark 21-12, 23-21 to reach men's singles quarterfinals. Later in the day, HS Prannoy also suffered a second-round exit after losing 11-21, 11-21 to Kento Momota of Japan. Sindhu, seeded fourth, took just 27 minutes to get the better of Indonesia's Lyanny Alessandra Mainaky 21-9, 21-7, while sixth seed Saina tamed another Indonesian in Yulia Yosephin Susanto 21-16, 21-11. 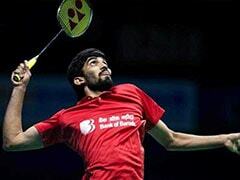 Kidambi Srikanth defeated Thailand's Sitthikom Thammasin 21-17, 21-18 in a 41-minute match. Sameer Verma defeated Thailand's Suppanyu Avihingsanon 21-14, 21-6 while HS Prannoy eked out an 11-21, 21-16, 21-18 win over France's Brice Leverdez.